Unlike my husband I’m no die hard cricket fan. I do however like an occasional day at the cricket and nothing beats being in the sporting crowd to watch England and Australia play for the Ashes in Melbourne. This is the second time I’ve joined the Barmy Army’s Supporters Club with my maiden game four years ago. Second time around I was old and wiser. This time we took plenty of food to keep our strength up and save us queuing and missing valuable cricket time. Also, lots and lots of sunscreen, hats and clothes to keen covered up. As it turned out the more clothes the better to start with as there was a chilly wind and overcast skies. Just as the skies turned blue and the sun came out England continued to bat their way to a commanding lead. All a little different from last time around when England were drummed into submission leaving thousands of English fans to drown their sorrows in the Melbourne shopping sales. 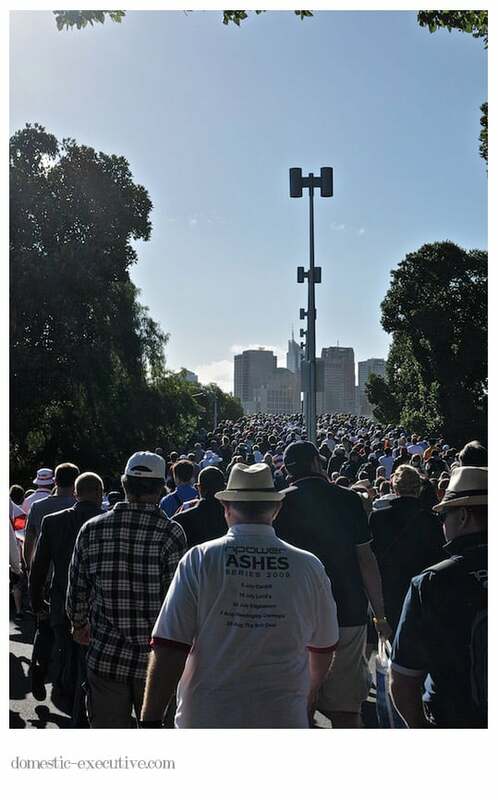 Although it was Australia’s misery this time everyone leaving the ground were good humoured which was just as well as there were thousands of people winding their way back towards the city centre no doubt for an evening of post match review.